Ever left a meeting wondering who, if anyone, took notes, what decisions were made, and who is responsible for what tasks? MeetingBooster is a meeting management system with a meeting minutes module that captures notes, assigns action items, formats the minutes into a professional looking document and distributes the meeting minutes with a few mouse clicks. "Never have our meeting minutes been this professional and concise. The cloud storage makes it easy to browse and search topics across meetings." MeetingBooster Meeting Minutes software makes it easy to accurately document conversations and decisions. As attendees discuss the agenda topics, a note taker can quickly select the attendee by name and document their comments, improving transparency for the group regarding the topics being discussed. By following a simplified agenda outline, the note taker can easily navigate through the agenda, ensuring that they capture the important details as they transpire. The note taker can assign action items to ensure ideas are turned into action plans. Use a variety of tools such as the popular Voting and Rating features. Consolidating notes and formatting meeting minutes can be tedious and time-consuming. MeetingBooster Meeting Minutes software automatically converts the notes, conclusions, action items and other information taken during the meeting into a professionally formatted meeting minutes document. Choose from various layouts and view minutes as detailed discussions or conclusions only. 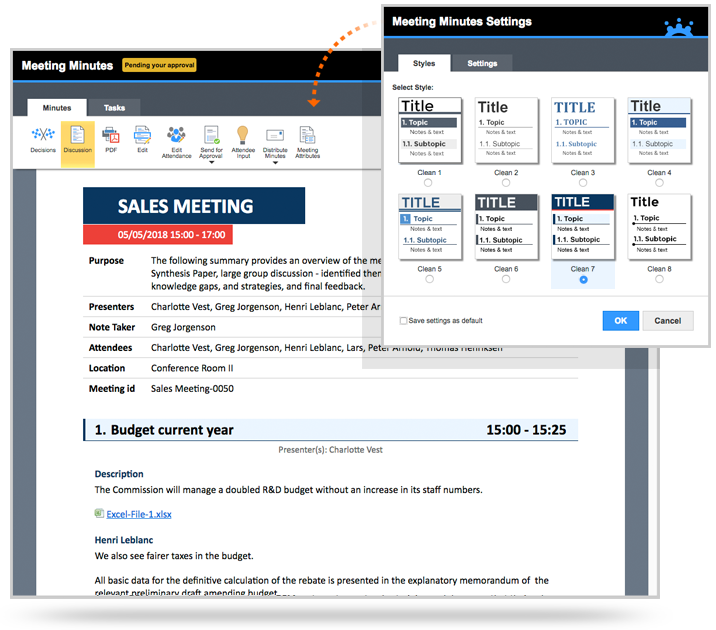 With MeetingBooster Meeting Minutes software, you can create a professional looking minutes document with a few simple mouse clicks. Meeting minutes should be easily accessible to attendees and relevant management as soon as possible. With company document formatting requirements, and many employees working remotely, the meeting minutes accessibility can pose a serious challenge. MeetingBooster Meeting Minutes software's automated distribution system guarantees that minutes are sent to desired attendees in a timely manner. A professionally formatted PDF document containing the meeting notes, conclusions, attached files and tasks is sent to all designated recipients. Archiving meeting minutes can be complicated and requires discipline. Locating and reviewing meeting minutes pose its own challenges when using a company intranet, shared folder or when emailing minutes back and forth. MeetingBooster's meeting management system stores all meeting minutes online, archiving them by meeting title, date, host or even grouped into a Meeting Series. This makes it easy to access the minutes by anyone with viewing permission. Users can also search across several meeting minutes documents to find discussions and merge search results into a consolidated document. This makes the review process less time-consuming and more reliable. MeetingBooster was designed with security in mind, allowing access only to those who have been invited or have permission to view specific files. 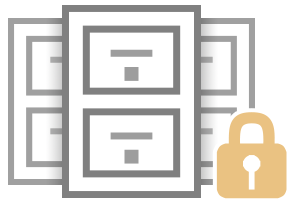 This means that sensitive information is securely archived and remains secure at all times. MeetingBooster includes a Permission System with customizable Security Roles. The system can be synchronized with Active Directory.